It had been suggested that a visit to Union Station would be enjoyable and indeed it was. Constitution Avenue brought us to the Capitol, where we turned north on Louisiana Avenue to the station. The grand exterior and incredibly designed interior are magnificent to behold but the way they have marketed the space is extraordinary. It is a multi-level enclosed mall with top-notch shops and restaurants. Sure you can catch a train and you'll have a lot of fun doing it but be sure to include a stop at the food court, the largest we have ever seen with an incredible range of choices. This is a great place for lunch or a snack. We arrived at the Supreme Court building just in time to join a group receiving a presentation about the history and workings of the court. Sitting there in the chamber flanked by 24 marble columns, with the raised mahogany bench behind which the Justices sit during sessions, we were keenly aware of the importance of decisions made within these walls. Highs on the walls of all four sides of the chamber are sculptured marble panels depicting legal themes and famous lawgivers such as Moses and Confucius. We took the Metro from Capitol South to Foggy Bottom to visit the Kennedy Center. The Center provides free bus service to and from the Metro entrance every fifteen minutes. Free tours, lead by volunteers, are offered daily (except Christmas). The Center is a national memorial, open to all, and is a working performing arts center. We visited the Concert Hall and the Opera House and viewed the Presidential Suites for the pleasure of the President when he attends performances. The Grand Foyer, one of the world's largest rooms, features the famous Robert Berks sculpture of President John F. Kennedy and eighteen Orrefors crystal chandeliers, each weighing one ton. The River Terrace overlooks the Potomac River and offers stunning views of D.C. and neighboring Virginia. One of two grand hallways is the Hall of Nations, displaying flags of nations around the world. International works of art and artifacts have been gifted to the center and are displayed throughout the building. It was a long day of walking and sightseeing and we were famished. After a brief stop at the hotel to refresh, we strolled down the block to Pesce, 2016 P Street, NW. Regine Palladin has owned this fish market and bistro cafe for seven years and her presence is everywhere, making sure her customers are well served. It's a place for seafood, from the nautical environment to the fish counter, take it home, eat it here, it's fresh and it's good. There's a chalkboard menu that changes daily. The staff is young, cheerful and eager. After a mesclun and diced tomato salad dressed with the perfect extra virgin olive oil and balsamic vinegar blend, we both enjoyed personal favorite choices. Sautéed soft-shell crabs on a bed of fennel, red onion, mango and tomato coulis for Linda and a thick filet of roasted bluefish on a bed of risotto with tarragon and leeks for me. Garnishing both plates were extra thin slices of lightly fried sweet onions, which were heavenly. Linda finished with a naughty but nice chocolate creme brule' and I had chocolate royal, which is indescribable and must remain a surprise until you venture to this wonderful seafood bistro. We loved it! They take reservations for parties of six or larger so it's best to arrive before seven in the evening to avoid a long wait. 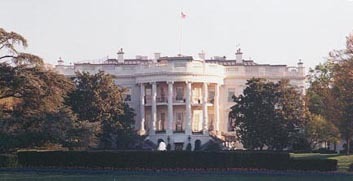 The White House is open to the public more than any other residence of a Head of State. The superb guides lead groups through at a pace that allows one to appreciate the experience. The large East room is used for receptions, ceremonies, press conferences and social events. As the guides explain the history and function of each room, you naturally visualize the TV images stored in your mind. The red, green and blue rooms are where State visitors are entertained. Each of the rooms is beautifully decorated and portraits of Presidents past dominate the walls. The State dining room and the entryway, with the staircase leading to the Presidential residence above round out the tour. It's a magic moment being in the home of the President of the United States of America. The visitors' galleries of Congress proved to be the highlight of our visit to Washington. Fortunate to have chosen to visit Washington while Congress was in session, we were lucky to be in each gallery at a time when most of the Congressmen were present for voting on pending legislation. We were completely thrilled by our ability to observe the Congressmen going about their daily business. There were just a few Senators debating on the floor when we sat down in the visitors' gallery above. Very soon thereafter, a vote was called and within fifteen minutes, they all came walking through the doors onto the Senate floor to cast their ballots. It was fascinating to see in person the personalities we had come to know on TV. Regardless of which side of the issue or how hard the fight, these men and women were enjoying their status as members of the same exclusive club. The Capital Grille at 601 Pennsylvania Avenue, NW, is a short walk from the Capitol and is a long established dining spot for steak, chops and seafood. The hostess would have loved to seat us in the very pleasant cocktail lounge at the front, but we insisted upon non-smoking and she graciously seated us in the main dining room. The restaurant exudes sophistication with dark woods and elegant furnishings. The service was extraordinarily good. We had been up quite early and had done a great deal of walking between visits and it was nice to relax in such a comfortable environment. Linda's Bloody Mary and my Gin and Tonic certainly enhanced our mood. Our waiter carefully detailed the day's specials and the unique dry aging process of the beef, which he highly recommended we try. Linda had a ten-ounce dry aged sirloin sliced on a lovely salad with Roquefort vinaigrette. I went crazy, starting with a salad of chopped tomato and sweet onion topped with chunks of Roquefort, the ten-ounce sirloin and a half order of Sam's mashed potatoes. Every item was perfection, but most outstanding was the sirloin. All fat had been trimmed and the dry aging process produced a fabulously tender and tasty result. It was a deliciously long and leisurely lunch that really hit the spot. Across the way on Constitution Avenue between 3rd and 7th Streets is the National Gallery of Art, which was created for the people of the U.S.A. by a joint resolution of Congress, accepting the gift of financier and art collector Andrew W. Mellon. The paintings and sculpture given by Mellon formed a high quality nucleus around which the gifted collections have grown. The Gallery is supported in its daily operations by Federal funds. All works in the collections have been given by private donation. Admission is free and the Gallery is open daily (except Christmas and New Year's Day), Monday-Saturday 10-5, Sunday 11-6. This might be the best buy in town. Just to see the magnificent rotunda is worth a visit. The design and layout make it easy to stroll at your own pace. There are comfortable places to sit. The collections are glorious. Do it yourself or take a tour, but don't miss it. You will go neither thirsty nor hungry as there are cafes, a buffet and a restaurant. We had noted on our map that there is a Jewish Museum of Military History at 1811 R Street, NW not too far from Dupont Circle. It is operated under the auspices of the Jewish War Veterans of the U.S.A., National Memorial, Inc. and chartered in 1958 by an Act of Congress. This small gem of a museum documents and preserves the contributions of Jewish Americans to the peace and freedom of the U.S., educates the public concerning the courage, heroism and sacrifices made by Jewish Americans who served in the armed forces, and works to combat anti-Semitism. Admission is free. Monday-Friday 9-5, Sunday 1-5. Most touching was the personal experiences of the Jewish American soldiers who liberated the concentration camps and how it affected their lives. This was the night of TheTravelzine get-together we'd looked forward to for so long. Ann and Kirk (from Virginia) had invited their friends Monica and Tony (from Maryland), who've since become Ziners, as we call members of our Internet travel discussion group, to join us. Ann and Kirk had traveled to Toronto, Canada, and Clearwater, Florida, to be with us at previous get-togethers and we were happy to be in their neck-of-the-woods this time. We met at the Brickskellar, 1523 22nd St., NW, best known for its extensive collection of beers. It's basically a pub and a good place to meet and start the evening. We enjoyed a Belgian beer that Kirk had discovered, got caught up on events since the last time we met and got to chat with Monica. Tony would be joining us shortly at Johnny's Half Shell, 2002 P St., NW, again a seafood restaurant in that wonderful strip between Dupont Circle and our hotel. We had a bit of a wait as we arrived at a peak time. The dining room is long and narrow with tables grouped at the front and booths running the length between the bar and the kitchen. It was a relaxed atmosphere for enjoying our time together. Linda and I had frito misto (shrimp and calamari) and wood-grilled wild rockfish filet. Both were quite good and we enjoyed the homemade coffee ice cream we shared for dessert. Everyone enjoyed the meal. The service was good and the waiter was a decent photographer. It was a fun get-together with old and new friends. As we were checking out, I was talking with a woman we had met in the lobby at the beginning of our stay and she saw that we had just a carry-on piece of luggage each. She knew we had stayed three days and asked how we managed to travel so light yet look so well and comfortably dressed. I referred her to our packing hints page. With the airlines having reduced the size of carry-ons, we had recently purchased the new allowable size for the airline we fly most often, Air Canada (19" x 9" x 14"). It's really getting difficult and it's necessary to find fabrics and styles that not only coordinate, but also take as little room as possible and travel well. Linda found a line of ladies travel wear by Glensport, called Authentic Travel Wear that worked so well on this short trip that she is confident it will be fine for our 27 day trip to Europe in May. (We leave three days from the time of this writing!) She is delighted that she will be able to fit the same number of garments (even a couple of extra tops) into less space and look better coordinated. For my part, I decided to reduce the size of my toothbrush! Seriously, she looked so terrific I insisted that she model the outfits so I doubled as a photographer - not bad, eh? On the way back to Toronto we overnighted in Saratoga Springs, 30 miles north of Albany. The town is famous for its naturally carbonated waters and thoroughbred racing. We arrived right after a 13-inch snowfall and were greeted by the gorgeous site of snow-covered forests and magnificently maintained old Victorian homes. What a pretty town! We stayed at the Six Sisters Bed and Breakfast,149 Union Avenue. Innkeepers Kate Benton and Steve Ramirez were on hand to warmly greet us. The Inn is a uniquely styled 1880 Victorian. Inside, the rich golden oak floors and Italian vero marble are adorned with classical Oriental carpets and there are antiques and Victorian touches old and new. The guestrooms are immaculate, each with private up-to-date bathroom, some with whirlpool tubs. Our spacious bedroom, Elizabeth Marie, had a cozy king-size bed, TV, small refrigerator, air conditioning, hairdryer and quality amenities and of course a couple of attractive blue bottles of Saratoga water, which we now have as souvenirs in our bathroom at home! Steve reviewed all the restaurants in town and we selected the Old Bryan Inn, 123 Maple Avenue, which is a favorite of locals and knowledgeable tourists. Wood beams, exposed brick walls, wood plank floors, solid wood booths, tables and chairs and two roaring fireplaces create a feeling of country comfort. Our delightful waitress took our orders and quickly brought us two house salads, one with blue cheese one with balsamic vinaigrette, both perfect. And then - the lights went out! It was a power failure due to the snowstorm. Not knowing how long it would last, we decided to wait it out. An hour later, after moving in front of a fireplace for warmth and more light (we also had candles), they informed us that the news wasn't good. There was no knowing when the power would be restored. They didn't want us to go hungry (the whole town was without power) so they whipped-up a cold roast beef, cheese and veggie feast and finished us off with a fantastic chocolate chip pie and ice cream. All's well that ends well. We look forward to returning one day to order from the regular menu and once again enjoy the caring attention of the friendly host and staff. The power was out when we returned to Six Sisters. Kate and Steve were ready with candles, flashlights and extra blankets. We were doing nicely and looking forward to cuddling under the covers when the lights went on. Lucky or what? Well, it depends on your perspective. In the morning we had the large dining room table to ourselves, as the other guests were sleeping-in. Steve served us nicely cut-up fresh fruit and orange juice and proceeded to prepare egg white omelets filled with vegetables, which he served with sausages, homemade 9-grain bread and homemade jam. All this with delicious blended coffee made for a perfect start to the day. We said our good-byes, got on the road and headed home to Toronto.